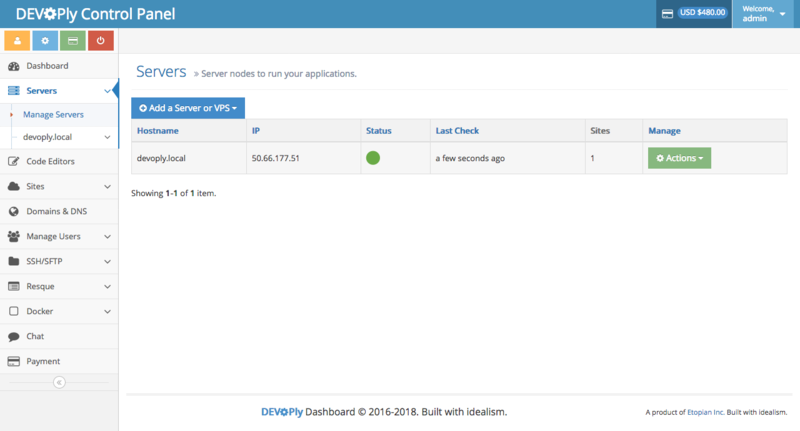 A hosting control panel that installs, configures, and manages multiple WordPress sites on any VPS or dedicated server using Docker for free. For example deploy 10 WordPress sites on a $5 Digital Ocean Droplet in around 10 minutes. Save $95 compared to WPEngine! Premium WordPress Hosting and Management for Everyone! Automatic backups and one click upgrades for all your containers and sites; including container images, core, plugins, modules, and themes means that you can keep everything updated without having to worry about breaking sites. Roll-back containers, files, and databases to restore functionality with a click. With shared hosting setups you have to worry about compromised sites. Our solution keeps all your sites updated and backed up. We use Docker containers to isolate each site in its container, keeping the malware confined to a single exploited site. Premium hosting is big business. Just ask WpEngine or their competitors. Providers charge anywhere from $20 to over $400 per site per month for hosting. We make it easy to provide premium hosting and maintenance services thereby allowing you to add thousands of dollars to your bottom line. You can configure any site including dev and staging sites to use git deployed from Bitbucket or Github. Each time you commit to the configured branch of the repository DEVOPly can automatically deploy your changes to your sever. Each site and each service on each of your servers is provided as a container. The big benefit of this is that the container is a self-contained operating system that can be upgraded separately from the server. If the upgrade fails, the old container can be rolled back. Features similar to ManageWP. 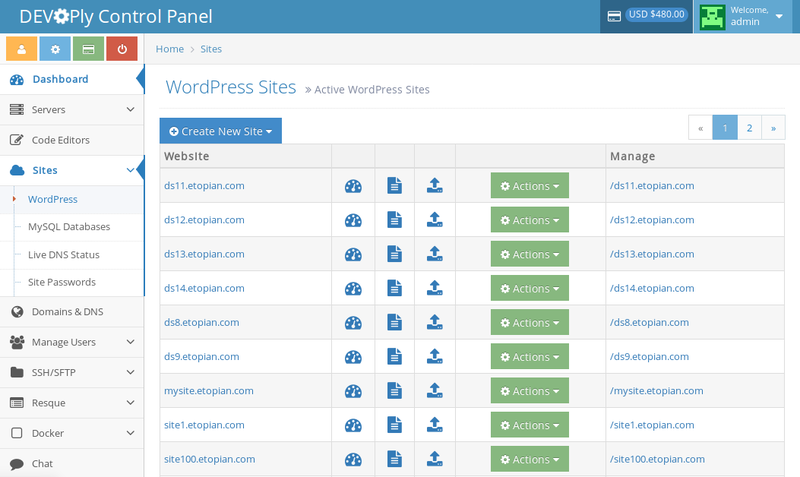 Update WordPress core, plugins, themes from one place. One click login and management of comments. Add themes and plugins from one place. Clone existing sites, change domains, or add SSL certificates. We have chosen Amazon Web Service's Route 53 which allows us to automatically provision and configure DNS for your new website in a few seconds. While this adds a bit of cost to deploying a site, you will be pleased at being able to access a site a minute after you have created it. Our DNS monitoring allows you to see if your DNS is not configured correctly. This has the benefit of solving DNS issues as well as domain expiry very quickly. Keeping an eye on your server is important. You need to know if your CPU is overloaded. If you need more memory. Or if you are running out of hard drive space. We provide tools to monitor your VPS or your dedicated server. 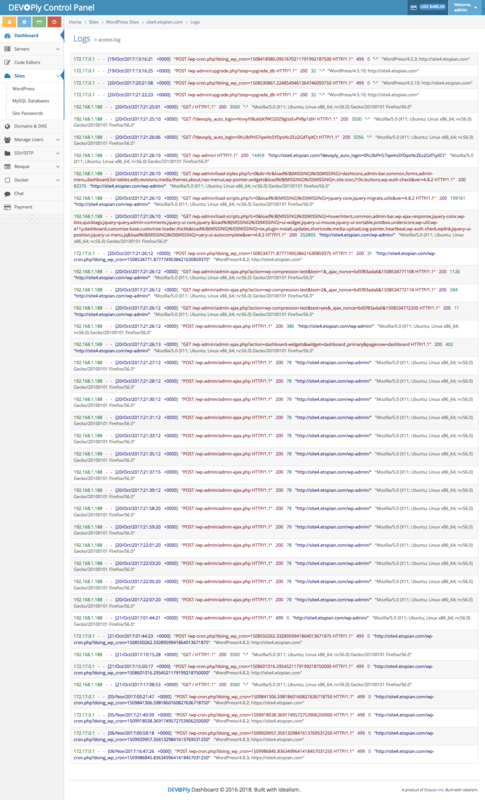 Real developers don't mess around with live sites, they use development and staging enviornments to work on their code. 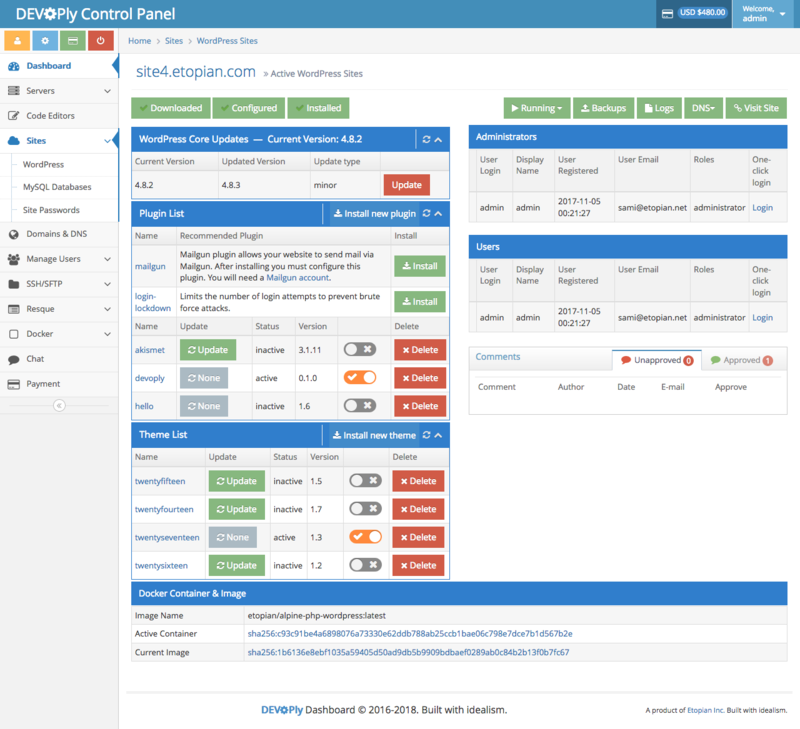 DEVOPly will create unlimited number of development and staging sites using git for you with minimal hassle. Having to set up a development environment on your own laptop can be an annoying headache. DEVOPLy can deploy a code editor backed by git which allows you to edit code online which makes the process of development much easier. Being a SaaS platform means that you don't have to maintain a control panel on your VPS or dedicated server. This saves spaces and alleviates upgrade headaches. We take the stress out of running a control panel on your server. All the powerful features you could want, at very little cost! Let's Encrypt provides free SSL certificates that our offering automatically configures. Each website runs in its own isolated container which contains its files along with an instance of Nginx server. View access and error logs from each container through the control panel. 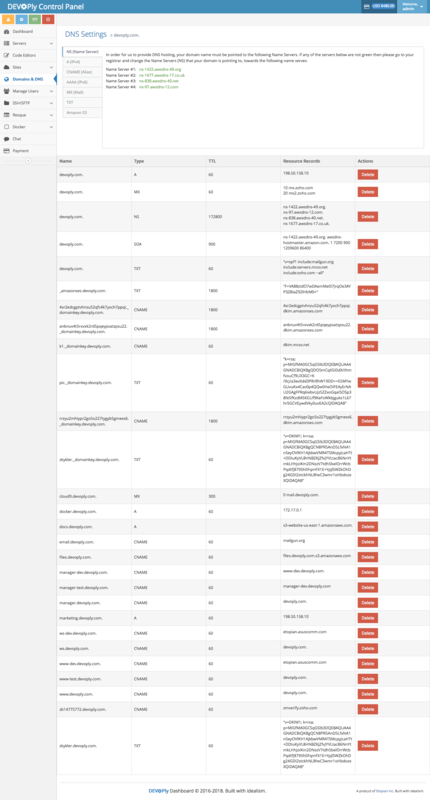 All your website logs in one place. Each container runs a NGINX-based PHP 7 stack to power your website. Multiple sites are supported using an NGINX reverse proxy. It's even possible to deploy your actual site using a LAMP stack using a different container than the standard container. We include a full client for Docker Engine to allow for pulling images and provisioning containers. Deploy additional services to your servers with a click of a few buttons. We also provide an automatically configured reverse proxy to expose multiple services to the web. We have included tools to deploy and manage multiple WordPress instances as simply as filling out a form. We will also configure MariaDB/MySQL for you by creating the database and user. DEVOPly implements a full client for Amazon Web Service Route 53 which allows us to automatically provision and configure DNS for your new website in a few seconds. We deploy MariaDB, a MySQL fork, on each server and automatically configure it by creating databases, passwords, and users. We further provide phpMyAdmin to help you manage your database. 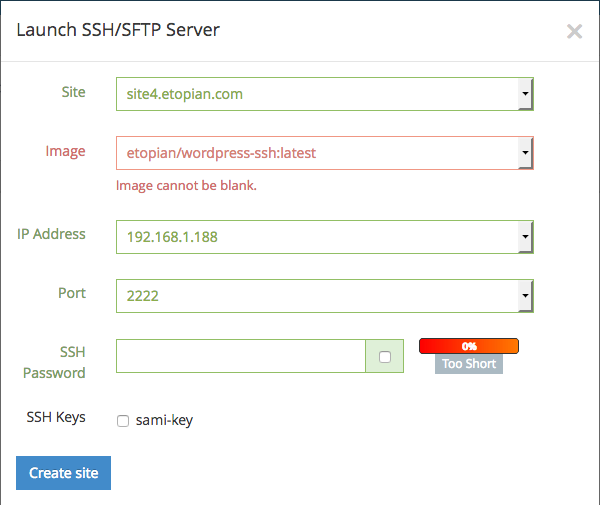 For each site you can deploy a SSH/SFTP server with your own SSH key or password to transfer files and use tools like WP-CLI and Drush. Deploy Redis caching server to increase the performance of your WordPress website. Launch a code editor on each website to edit your site online including development copies. Deploy Solr search engine to improve search performance and add better search to Wordpress. 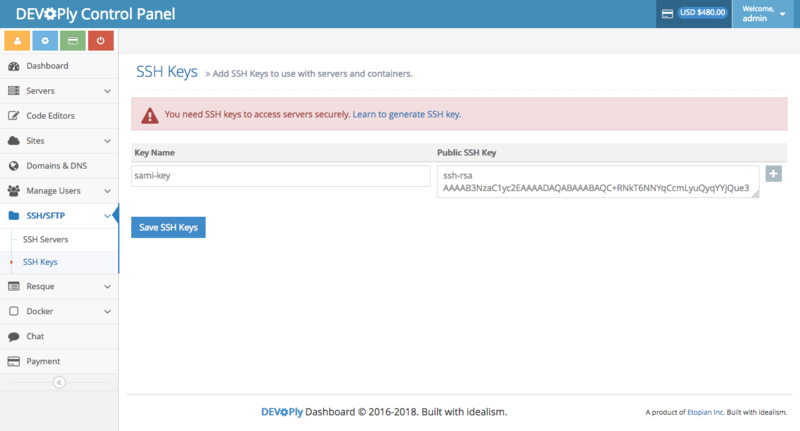 You use DEVOPly with your own servers. 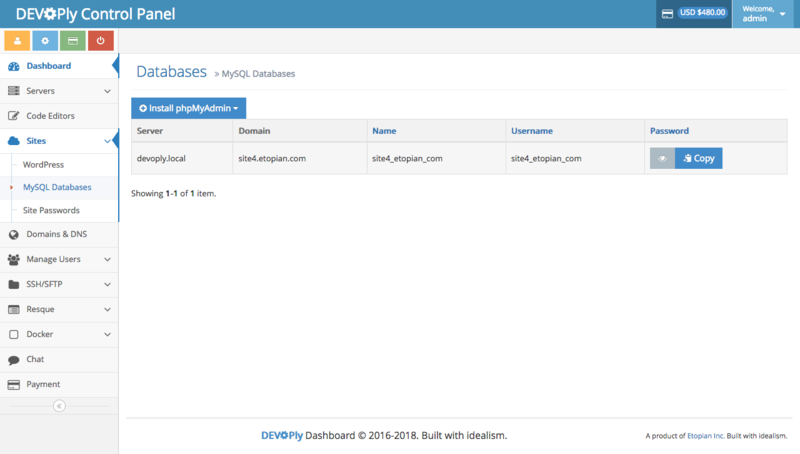 You can deploy DEVOPly on any dedicated server or VPS. We currently support 16.04 Ubuntu LTS, and will support future versions of Ubuntu LTS. Manage all your sites from a single interface. 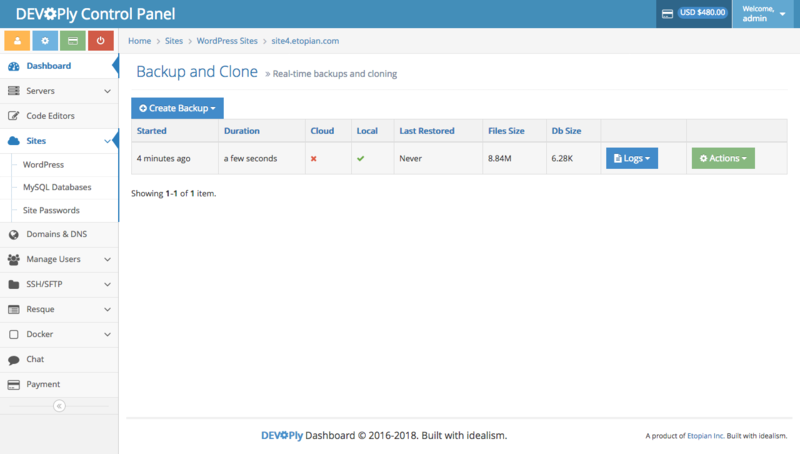 Backup and clone your sites with a click of a button. Have any comments or questions, please contact us! DEVOPly 2016-2018. Built with idealism. A product of Etopian Inc.